Put simply, a sand sculpture is a construction made of just sand and water. This is the famous sand castle, but the sculpture could also be a composition of other architectural forms, anatomical figures (people and animals) and objects. When one has the right sand and the right techniques, then almost any shape in sand made. Sand sculpture becomes an art form, even 4000 years BC the Egyptians used. Sand looks much the same, but that is not the case. Sand has a great diversity, the origin determines the application. The origin of sand from organic or mineral origin. Organic sand grains are tiny fragments of corals, shellfish and fossils, this species can be found near salt water. Mineral sand or sand rock consists of small pieces of minerals and other rocks and comes from mountainous areas, such as the Alps. Using photographic magnification, these differences are clearly visible. 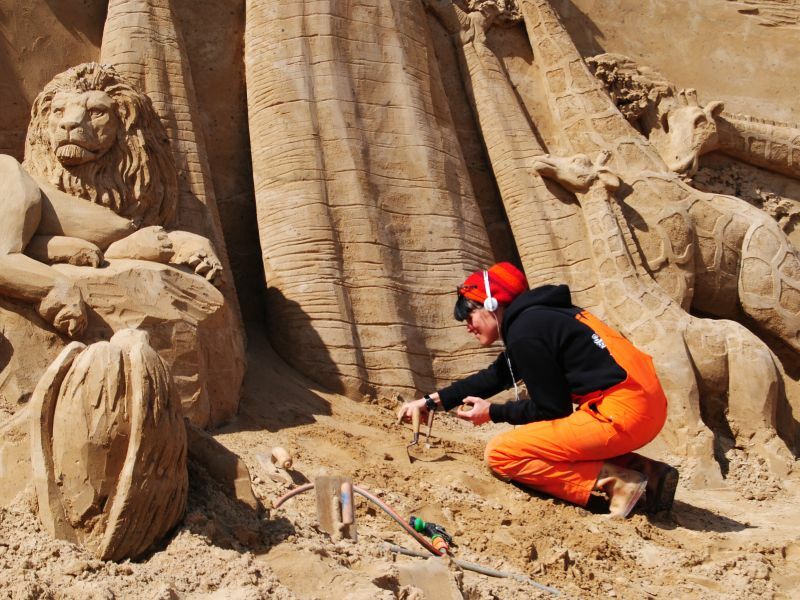 To make beautiful and steep sand sculptures, we need sand that can be piled very high. The granular form is very important. Try to stack marbles, it appears this is not possible because everything falls apart. If you pile blocks or dice, this is no problem. This is the same with a sand sculpture. The beach consists of sand grains that, by the influences of tides and waves, started to roll over each other and become as round as marbles. These smooth grains are less suitable to build a sand sculpture. The ideal sculpture sand has an angular grain and is less eroded. This perfect sculpture sand comes from the River Maas it has been carried with water from the Alps. These sands minerals still look like cubes of different sizes, and fit together. 1. Of loose sand is a hard block is made by putting layer by layer wet sculpture sand in the raw form (mold) to compact. This filling of the molds is repeated until the desired height is reached. 2. Carving shapes in the hard block of sand. This is always done from top to bottom. For compacting loose sand we use wooden molds. These molds can vary in size and shape. The smallest mold used is a plastic tube of 30 cm and a diameter of 12 cm. Larger molds are made by using wooden sides with a height of 60 cm. By linking different lengths, forms of any shape can be made. From square to octagon with a diameter up to even 10 meters. For cutting the sand special tools are used. For detailed work, palette knives are used in painting. For les detailed work bigger tools are uses, these are the rolls tools also used in construction work. From a crane to a shovel or a straw and brushes, it can all be used as tools. Every builder has his favorite tools is related to his specialty field of sculpture. A carver should be able to imagine how the sculpture should look like and what sizes is the design. With lots of practice they have gained their experience. This also applies to the various specializations in sculpture. One carver prefers to make architecture, others prefer to make figures. Both disciplines have different skills. A carver has to be able to carve straight and tight or have an eye for anatomical proportions. Anyone can learn it and with patience and practice u might even become a good carver. Does the sculptures consist only of sand and water? Yes, only sand and water is being used. Where does the sand sculpture from? It is river sand from the river The Maas. If it rains, nothing happens with a sand sculpture. The rainwater is being absorbed by the sand and evaporate again when it stops raining. What happens if it's windy or storms? Wind is no problem for a sand sculpture. Because the sand is compacted so hard, wind has no impact on a sculpture. A sand sculpture can easily survive 7 wind. 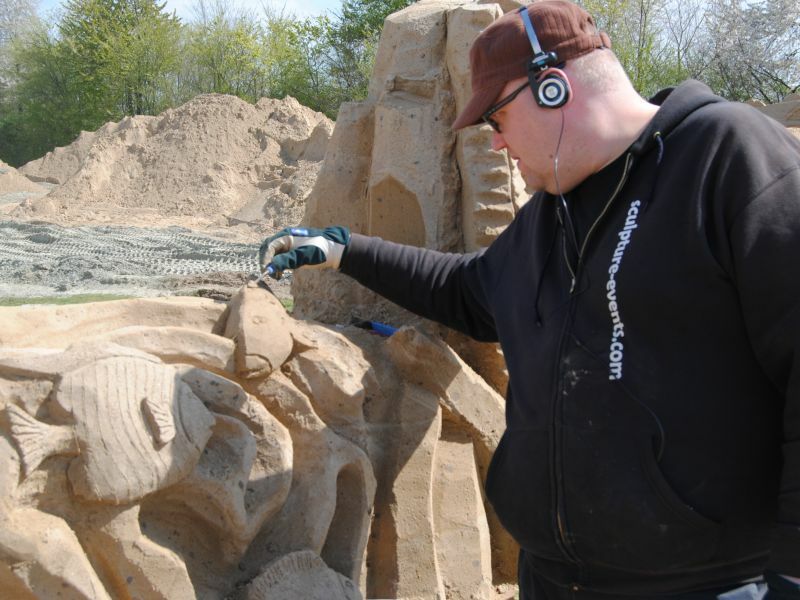 Should a sand sculpture be kept wet after it is finished? No, only when working on a sculpture the sand is moist. When the sculpture is finished it may completely dry out. The sculpture does not fall apart because the sand is compacted so hard.